If you live anywhere within the continental United States, chances are very good that you have house sparrows. These non-descript brown birds make their homes just about everywhere that we choose to make our homes, from city condos to country escapes, and all the suburbs and small towns in between. They are among the three most common birds in the country. Despite their abundance, house sparrows are not native to the United States. The birds were deliberately introduced to North America several times in the mid-1800s, and haven’t looked back since. The trouble with house sparrows isn’t really their abundance. Nor is it their non-native status. No. The trouble with house sparrows is more basic — these birds are bullies. House sparrows will readily chase native bluebirds and other cavity nesters from their homes. They will destroy the eggs of other birds, murder their chicks, and even attack, injure, and sometimes kill adult birds they find and trap in their nests. Now, some people may not mind. For someone who has never watched the cycle of courting, nest-building, and fledging, a nesting pair of house sparrows may even seem a welcome sight. If you are one of those people, I hope you’ll consider taking a different stance this coming spring. By discouraging house sparrows, you give native bluebirds, chickadees, titmice, and more a fighting chance. There are many ways to discourage house sparrows. Some people trap the birds. Others destroy their nests. I prefer to prevent their nesting in the first place. This requires a bit of time and awareness, but I feel that’s time well spent. Last year, for example, the nest boxes in and around the Outlaw Garden fledged two families of bluebirds, one family of chickadees, and one family of titmice. That’s some pretty great motivation! My favorite way of discouraging house sparrows requires little more than a few thumb tacks or nails, scissors, a hammer, and some fishing line. 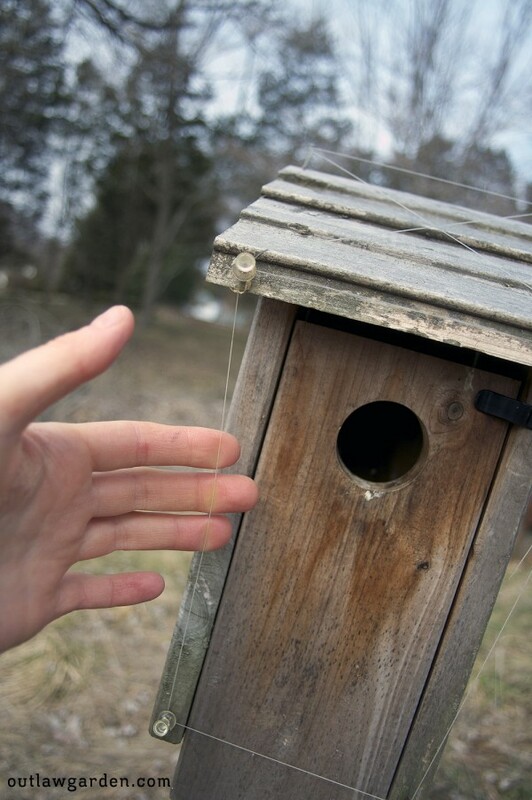 Once you have your supplies gathered, it takes no more than a minute or two to protect each nest box. Grab your supplies and head outside to your birdhouse(s). Using your hammer, gently pound four tacks or nails into the four corners of the roof. Attach two tacks or nails to the front of the roof, more-or-less directly above the bottom of the box. Finally, attach two tacks or nails to the bottom front corners of the box. 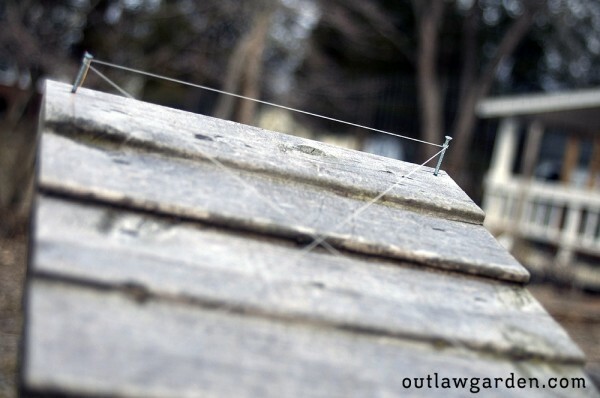 To begin, tie your fishing line to one of the tacks or nails on the roof. Pull it taut, and wrap it around the other nails/tacks both side-to-side, top-to-bottom and diagonally. You want the line to be approximately one-inch about the surface of the box. Once done, you should have created a square and an X out of the fishing line. Tie it off and cut off the excess. Next, tie your fishing line to one of the four nails/tacks on the front of the box. Pull the line taut, and wrap it around every other nail/tack on the front until you have created a square of fishing line around the front of the entire box. Do not run diagonal lines. Tie off the line and cut off the excess. Test the line with your fingers. It should be fairly taut. No one really knows, but this little trick works very well (not 100% of the time, but close to it). House sparrows are spooked by the line, but it doesn’t seem to bother our native nesters, such as bluebirds, chickadees, or titmice. Perhaps house sparrows have worse eyesight, since they mostly eat seed. Maybe they think the fishing line is a spider web. Whatever the reason, it works. 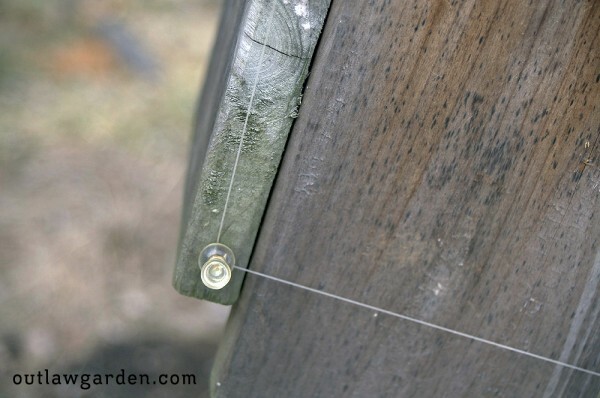 The fishing line on the front of the box prevents house sparrows from landing and entering the box (most of the time). And, the fishing line on the top of the box spooks the males, who usually perch on top of boxes they’ve claimed. Some recommend hanging loose line from the eaves of the box, and weighing them down with fishing weights. I do not do this because I worry about the risk of an adult bird becoming entangled in the line and/or pulling the line into the box with them. I just feel safer using line that is tied down and taut. This deterrent works most of the time, but you may still experience trouble with some boxes. If house sparrows persist, consider adding more line, perhaps on longer nails so that the line is elevated higher above the box’s surface. Or, perhaps simply relocate the box. Fishing line will degrade over time in the sunlight, and may eventually break or loosen from the tacks or nails. I recommend checking the condition of the line at least once a month, and replacing any line or tacks that look compromised. I generally remove the line entirely for the winter months, and replace it with fresh line in February or March, when birds start exploring potential nest sites. Fishing line can entangle birds and other wildlife. When using this, please ensure that you remove all loose line from your yard or garden. If you have any additional suggestions for protecting bird houses from house sparrows, please share your tips in the comments section below. This is the perfect time to be setting out those birdhouses — lots of birds house-hunting right about now. Good luck! Do keep up the good work. Wish you well! This is a great idea, I’ve never heard it before but have heard about their bullying habits. Thanks for sharing it with us! This has worked so well in my garden. I’m in a suburban neighborhood, and there are LOTS of house sparrows here. A bit of fishing line seems to stop them every time, and the bluebirds, chickadees and titmice don’t seem to mind it at all. I hope it works for you, too! 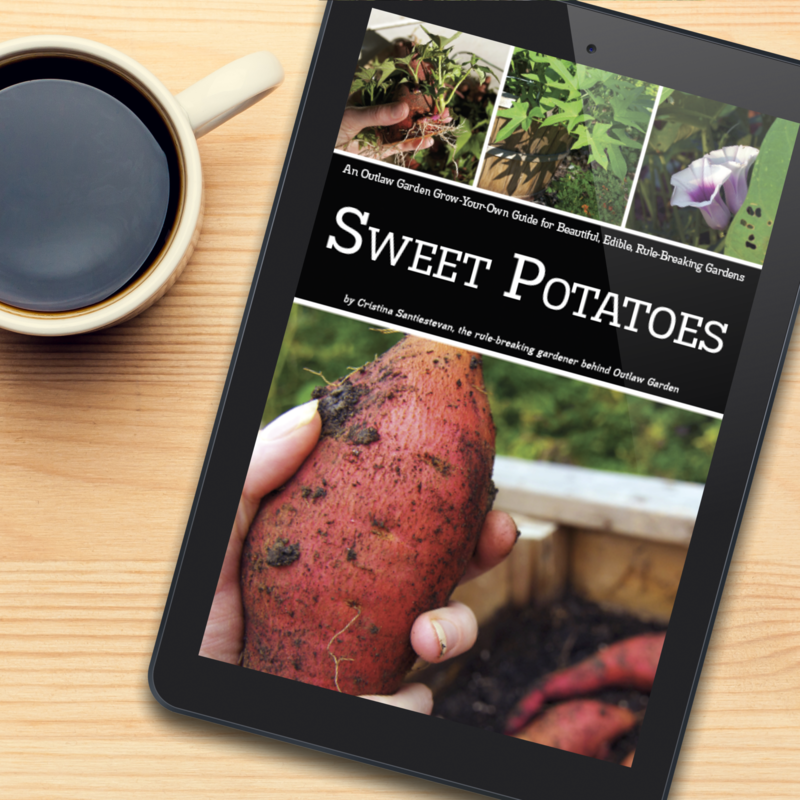 Thanks so much for your article! I’ve been horrified by the brutal sparrows trying to take over my nest box with chickadees. As a new bird watcher/provider, I’ve been frustrated trying to get them to stop. I made a foil strip spooker, but can’t wait to do what you do to prevent this. I have a log cabin with several nooks and crannies that they love to nest in. I’ve had SOME success with covering the areas with bird netting. I’ve also filled some of the holes with expanding foam — but the sparrows peck at the foam and eventually get in. Any other suggestions to deter? Thanks! I’ve never tried deterring house sparrows from anything but birdhouses, so I’m just guessing here… You might try using fishing line to hang some old and wanted CDs or other bright and flashy object. Or, have you tried mounting a decoy owl or hawk near where they nest? If the holes aren’t too large, you might also be able to fill them with wood putty. It’d probably be more expensive than the spray foam, but the sparrows shouldn’t be able to damage the putty once dried. Good luck! I just assembled the fishing line/tack to the house. I have a nesting pair of bluebirds who have lost two eggs this season to the house sparrows pecking and destroying them. The sweet bluebird couple have tried, again and there is a pretty blue egg in the box. The female bluebird has already been in her house. My concern with this deterrent is that I am unable to look inside the house due to the fishing wire obstructing opeing the roof door. Any suggestions? You may want to attach the line to the roof and the house separately. So, one line on the roof, that moves when you open the roof. And, then one line on the front of the house near the entrance. It’s not a 100% deterrent, but it does help a lot. Good luck to you and those bluebirds! Magic halos are new to me. Neat idea! I’ve never used them before, but imagine the success would be about the same. As for bird feeders, I just don’t have any (so no advice to offer there). I focus on planting a lot of bird-friendly shrubs and flowers instead. I had a chickadee nest in my bluebird house. Bluebirds not yet here (in Chicago suburbs). Chickadee was killed in a new bird house I put up. Very upsetting! I will put these up ASAP. Now, I have to figure out something for my Kingman (concrete) bluebird house! 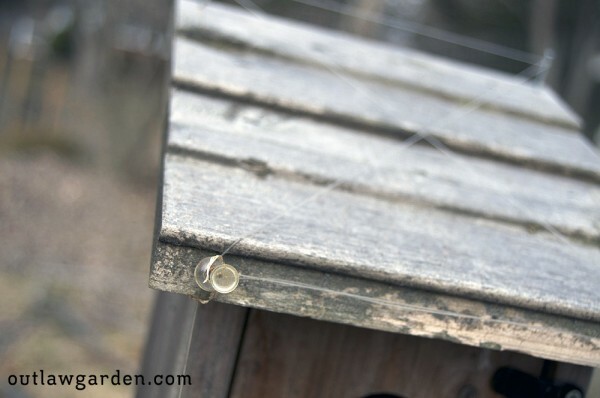 DO NOT put your bluebird or swallow houses out until after you have seen them in the area and then wait two weeks. Often these birds will have scouts that will examine the area to nest before the larger flocks of birds arrive. If you put your boxes out too early, the overwintering birds such as the House Sparrow will have first dibs to your nestbox. WAIT two weeks for larger numbers of desirable birds arrive to give them a chance to compete for the box. I have made this mistake before…. I tend to leave my boxes up all year (birds will use them for winter shelter too), but am also very watchful come springtime. Because, you’re right, house sparrows will definitely claim a birdhouse if given the chance. I fought the sparrows last year. Tried to put in fake eggs, and tried to shake them so they wouldn’t hatch. (I have a bird=cam, so was able to watch them from my TV.) Still had to watch as they hatched and fledged before bluebirds nested in that box. This year, I will leave the side open and not close it until after I see bluebirds for a couple of weeks. Thanks for the advice! Very helpful! How do you put the line up on a Gilbertson house. Having a problem with sparrows getting into the nest of a regular box, now building in the Gilbertson house. Trying to prevent it from happening again. (even had a sparrow spooker up on that house too!) Need to know how to protect them in the Gilbertson house. The Gilbertson style house… Is that the kind that’s often made out of a big PVC tube? I’m not sure. Maybe screw some small eye hooks into the house at a few strategic points, and then run the line through the eye hooks? Good luck! doing this today! fingers crossed that it works!!! did not work for us ? Bummer. I’ve had a few extra stubborn sparrows as well. The deterrent seems to work best if it’s installed before the sparrows discover the box. But, even then, it’s no guarantee. No suggestions for the feeder except the one you’ve already thought of: just eliminate the feeder. I will say that I haven’t noticed any sort of negative impacts caused by the house sparrows on birds that don’t nest in cavities. Hopefully that means your thrashers and cardinals and robins may be just fine.